An English language translation of El Faro's interview with Álvaro Saravia is now available online here. Major Roberto D´Aubuisson participated in the conspiracy to assassinate Archbishop Romero, although a son of former president Molina provided the sniper, asserts Captain Álvaro Saravia. Thirty years later, he and some of the other people implicated in the crime reconstruct those days of arms trafficking, cocaine and kidnapping. Reduced to ignominy, Saravia has been a pizza delivery man, a used car salesman and a drug money launderer. Now he is burning in the hell he helped create during a time when killing “communists” was a sport. 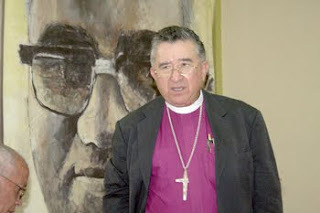 The president, Mauricio Funes, apologized today on behalf of the Salvadoran state for the death of the archbishop of San Salvador, Monsignor Oscar Arnulfo Romero, which occurred on March 24, 1980. "In my capacity as President, I apologize on behalf of the Salvadoran state for this assassination committed 30 years ago. On behalf of the Salvadoran State I apologize to the family of Romero, and I extend my condolences," said Funes, ... in the corridor between gates 8 and 9 of the airport terminal, where he unveiled a mural commemorating the religious leader. Responding to the words of Funes, Gaspar Romero, brother of the martyred archbishop, said: "I accept with humility, love and gratitude the apology, albeit 30 years later. " On March 24, 1980, while saying mass at the chapel at the Divina Providencia cancer hospital, archbishop Oscar Romero was slain by an assassin's bullet. Listen to a special BBC radio program about Romero and his legacy here. Thanks to David for pointing out the video. Former Salvadoran air force captain Álvaro Saravia has previously admitted to participation in the plot to kill Salvadoran archbishop Oscar Romero, although he denies being the gunman. Today the online periodical El Faro published a lengthy story with an interview of Saravia where Saravia names names and provides details of the plot. Shortly after the interview appeared on the El Faro site, the site was no longer reachable on the Internet. (coincidence?). I was able to grab a copy from the Google search engine cache, and you can download it here, if the El Faro site is not reachable. Saravia says the gunman was a Salvadoran from the security team of Mario Molina, son of former Salvadoran president Arturo Armando Molina. Mario Molina, along with ARENA founder Roberto D'Aubuisson, were the intellectual authors of the plot to kill the archbishop. If you want to learn about Oscar Romero for the first time, or want to introduce a friend to the life of "San Romero de las Americas," video and film is one way to do it. You can also search on YouTube for "Oscar Romero" and you will see a great number of Romero tribute videos of varying quality. According to reports from El Salvador an agreement was reached last night to end the occupation of the University of El Salvador. The negotiations occurred under the auspices of Human Rights Ombudsman Oscar Luna. University officials have agreed to review the cases of 235 students who were denied admission to the university in the most recent round of entrance exams. Since March 4, masked protesters have controlled the grounds of the University of El Salvador, shutting down the country's largest public university. The protesters are youth who were not admitted following the last entrance exams. The entrance exams were taken by some 23,000 students and 9500 were admitted to study at the UES. Those who are mot admitted often have few financial resources and very likely cannot afford the higher cost privately run universities in the country. The Rector of the University, Rufino Quezada, has been vocal in criticizing the police in being unwilling to retake the university. Quezada announced a plan to resume some classes away from the campus after a round of negotiations with the protesters was not fruitful. El Faro has a photogallery of the takeover of the UES here. During his recent visit to El Salvador, Brazil's president Lula de Silva visited the tomb of Oscar Romero with Salvadoran president Mauricio Funes. This year, for the first time ever, official El Salvador is acknowledging and commemorating the life of Oscar Romero, as the thirtieth anniversary of his assassination approaches on March 24. On March 4, the Salvadoran National Assembly passed a decree declaring March 24 each year to be Monseñor Oscar Arnulfo Romero Day. On March 24, president Mauricio Funes, who commited himself to Romero's option for the poor when he was elected the country's first leftist president, will apologize on behalf of the Salvadoran state for Romero's murder at the hands of a right wing death squad. Today a concert and cultural event was held in San Salvador in Romero's honor. President Funes, members of his cabinet, the diplomatic corps, and the slain archbishop's brother were in attendance. Fourteen months after Barack Obama became president of the US, there is still not a new US ambassador in the embassy in San Salvador. Last December, Obama nominated Mari Del Carmen Aponte to the position, but her appointment is stuck in the Senate. Some conservatives are urging that her nomination be rejected, citing allegations that in the past she had connections to someone who had connections to Cuban intelligence agents. El Salvador acted only slightly more rapidly, presenting its new ambassador to Washington on the morning before Mauricio Funes' March 8 meeting with Obama. The new ambassador is Francisco Altschul. Perhaps the US Senate needs to read the article by Sarah Stephens on the Huffington Post titled Why should we care about El Salvador?" To the surprise of many, El Salvador under the leadership of this center-left president and a party representing a former guerrilla army is becoming the most reliable Central American ally of Washington. Searching the Internet recently I came across the blog El Salvador: The Life. The site is "designed to help deportees and families of deportees (or anyone else planning to move to El Salvador) prepare for the process, what to expect and how to begin. This is not intended for tourist, but rather those planning to move." It has a number of posts about day-to-day life, including such topics as Internet access, the postal system, and plumbing. The most recent post provides a sample of grocery prices. Check it out. March 2010 is an important month for historical memory in El Salvador because it contains the 30th anniversary of the assassination of Oscar Romero. On March 24, 1980 Romero, the archbishop of San Salvador, was assassinated by El Salvador's ruling oligarchy. The bishop who carried El Salvador's poor in his heart, was murdered for his tireless denunciations of the oppression and violence he saw sponsored by the Salvadoran state. Throughout the month leading up to March 24, I will have a series of posts about Romero and his legacy. The act of coming together to strategize about protecting their communities against the ravages of big dams has finally paid off for some communities. The Salvadorian government announced in January that it was scrapping the proposed El Cimarron Dam. The dam, which would have blocked the Lempa River, would have displaced nearly 35,000 people from their homes and farms.